Move over chicken pot pie! This twist has a deliciously cheesy, saucy chicken filling nestled between, not one, but two flaky crusts. 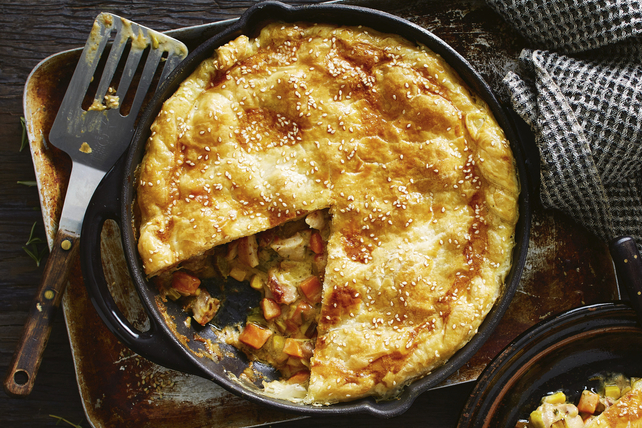 This hearty chicken pie is comfort food at its finest and is sure to become a new family favourite. Heat dressing in large nonstick skillet on medium heat. Add chicken and onions; cook 5 to 7 min. or until chicken is evenly browned, stirring frequently. Add carrots and fennel; cook and stir 3 min. Add all remaining ingredients except pie crusts; mix well. Cook and stir 1 to 2 min or until cheeses are completely melted; spoon into 1 pie crust. Invert remaining pie crust over filled crust; remove and discard top foil pan. Pinch edges of crusts together to seal. Cut several slits in top crust to permit steam to escape. Bake 35 to 40 min. or until filling is hot and bubbly, and top crust is golden brown. For a shiny golden crust, whisk 1 egg yolk with 1 Tbsp. water until blended; brush onto top pie crust. Sprinkle with 1 tsp. sesame seed before baking pie as directed. Prepare using Philadelphia Chive and Onion Cream Cheese Product.